When smart, independent woman Wendy (Marla Sokoloff of THE PRACTICE, DESPERATE HOUSEWIVES) learns that her estranged father has left her a beautiful winery in California’s Napa Valley, she is thrown head-first into managing the struggling business. Along the way, she must contend with a shrewd competitor (Christopher Lloyd of BACK TO THE FUTURE) while sparks fly with her local winemaker mentor, Chris (Barry Watson of SAMANTHA WHO?, 7TH HEAVEN). 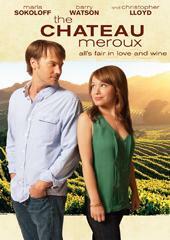 But when Wendy discovers that Chris is actually her competitor’s son, she questions her true feelings and must learn to follow her heart to save the winery.